(Nanowerk News) Researchers have shown how to increase the efficiency of thin-film solar cells, a technology that could bring low-cost solar energy. The approach uses 3-D "photonic crystals" to absorb more sunlight than conventional thin-film cells. The synthetic crystals possess a structure called an "inverse opal" to make use of and enhance properties found in the gemstones to reflect, diffract and bend incoming sunlight. "Usually, in thin-film silicon solar cells much of the sunlight comes right back out, but using our approach the light comes in and it is diffracted, causing it to propagate in a parallel path within the film," said Peter Bermel, an assistant professor in Purdue University's School of Electrical and Computer Engineering and Birck Nanotechnology Center. Compared to solar cells made of silicon wafers, cost is reduced 100 times for the thin films. However, they are less efficient. "The question is, can we make up that lower efficiency by introducing new approaches to light trapping for thin film solar cells?" Bermel said. "Can we combine low cost and high performance?" The researchers are the first to demonstrate incorporation of the 3-D photonic crystals to increase light trapping in crystalline silicon solar cells. Experimental findings indicate roughly a 10 percent increase in efficiency over conventional silicon thin films, with further potential for improvement. The technology is better at absorbing and harvesting near-infrared light. "A major reason thin-film silicon solar cells have lower efficiency is that they don't absorb near-infrared light very effectively," Bermel said. "Light in the near-infrared range is important because there is a lot of solar energy in that wavelength range and also because silicon can convert near infrared light to energy if it can absorb it, but thin films don't fully absorb it." 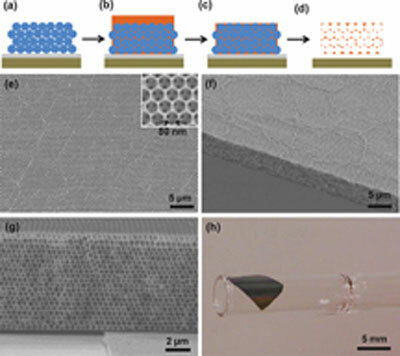 Findings were detailed in a research paper appearing in October in the peer-reviewed scientific journal Advanced Optical Materials ("Enhanced Photon Management of Thin-Film Silicon Solar Cells Using Inverse Opal Photonic Crystals with 3D Photonic Bandgaps"). The paper was authored by doctoral student Leo T. Varghese, who has graduated; research professor Yi Xuan; doctoral student Ben Niu; former doctoral student Li Fan, who also has graduated; Bermel; and Minghao Qi, an associate professor of electrical and computer engineering. The researchers created inverse opals using a process called meniscus-driven self-assembly. "You could make them to custom order or design, and we decided to make them for solar cells in order to improve absorption of light," Qi said. Silicon has for many years been the dominant material used in solar cells. However, solar cells made of thick monocrystalline silicon wafers are too expensive to be practical for widespread application. This limitation has driven recent innovation in multicrystalline and thin-film silicon solar cells. "Our premise is to use only 1 percent as much material as a silicon wafer using these thin films of crystalline silicon," Qi said. Applications for thin-film solar cells include generating electricity for utilities and the home, as well as smaller-scale applications such as mobile charging of electronic devices. Natural opals create rainbow patterns caused when different wavelengths of light are diffracted at different angles. Opals are made of solid silica spheres in a matrix of some other material. The new synthetic structures are called inverse opals because they consist of hollow spheres of air surrounded by silicon. The researchers first build a standard opal structure. The spheres are placed in a solution, which evaporates, leaving the self-assembled structure. "As it evaporates the spheres get stacked on top of the substrate right at the meniscus, the interface between the liquid and air," Varghese said. Manufacturers now increase light absorption by etching or depositing random textures on the thin films. "We think it is best to combine both the textured randomness as well as ordered structure," Bermel said. "The texture helps well with some wavelengths and the ordered structure will help with others."